In today’s article we will go on a trip to one pretty french city, located not far from Monaco and typically named Cap d’Ail. There we are lead by one amazing apartment interior design idea with harmonic and spacious interesting interior design, made by a famous designer NG Studio. We find the natural colors of sand and stones in wonderful combination with the colors of sky and sea under the twilight, creating one revealing atmosphere in each room, bringing with them bursting energy influencing on all people being somehow in contact with the amazing ambience, whith the apartment creates. Impressed by the natural beauty of Cote d’Azur, the talented team of the studio created with ease the interior, that we are right about to reveal to all you interested people. The architects share the fact, that their main goal in this project was the buildings premises to be elegant and fully functional simultaneously. The spacious apartment is separated in public and private zones for bigger comfort of the owners, so that all people being in contact with the place to know their place, also the family living there will have their necessary privacy. The private zone has common space, separated in three functional blocks (living room , kitchen and dining room), merging into one another. The logical sequel of the living room is with opened terrace, that offers unique views and green spaces. Bright green accents creates inviolable connection with nature, that automatically provides food for your soul, even if you are not hungry. 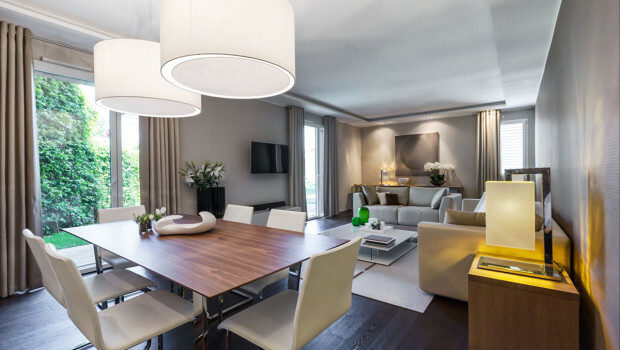 The apartment is carefully designed, to look and to feel as much as elegant it can, by encouraging the owners to live one simple life within the harmonic ambience and functional environment, which the stunning interior design provides. Bathroom Design, Bedroom Design, Decorating, Furniture Design, Home Design, Interior, interiors bedroom, Kitchen Design, Living Room apartment interior design ideas, famous interior designers, house painting, interior architecture, interior designing, interior designs for homes, interior home design, living room interior design ideas, modern interior design, Spacious apartment with functional and elegant interior. permalink.